President Richard Nixon signed the Marine Protection, Research, and Sanctuaries Act (MPRSA) in 1972 to both promote research in underwater ecosystems as well as nominate national marine protected areas (MPAs) as ‘National Marine Sanctuaries’ (Copeland, 1999). By establishing the National Marine Sanctuary Program (NMSP), the U.S. federal government would be able to protect and conserve its underwater natural and cultural resources. While NMSP’s intended purpose is to limit and control ecosystem degradation of important marine environments, the system has historically not been conducive towards connecting with private industry. Researchers have also questioned the system’s overall efficacy to provide substantial protection of its natural habitats, given underwater protected areas have no control over their boundaries (Owen, 2003). Despite this, MPAs are generally known to be one of the most effective tools to preserve marine biodiversity. Overall, full understanding of the sanctuary system’s full resources is still not clear. Pursuant to this need, researchers in the field of ecological economics have often sought to quantify the monetary value of ecological services. Such quantification provides managers with the information necessary to make key decisions regarding environmental protection and economic development. The balance between the two is becoming ever more important to manage as marine ecosystem degradation increases elsewhere. 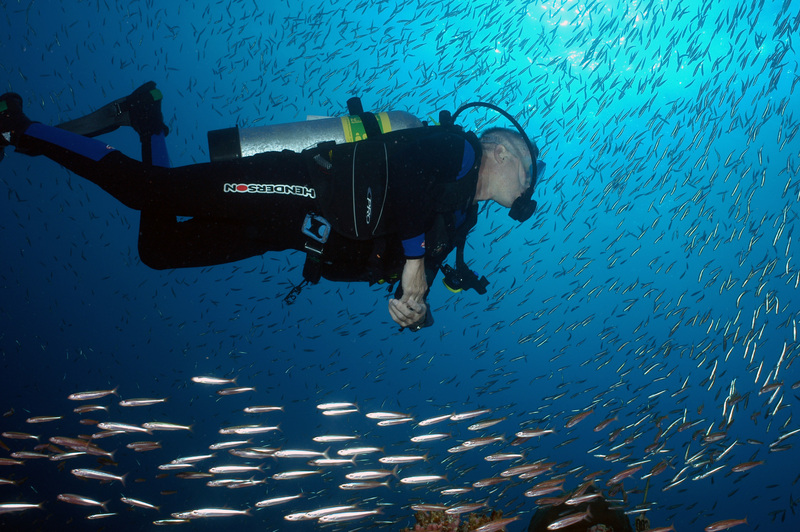 A scuba diver swims amid a school of fish at Flower Garden Banks National Marine Sanctuary. Photo: G.P. Schmahl/NOAA. Encompassing over 600,000 total square miles (965,606 km2) of underwater area, the sanctuary system is in fact larger than the entire U.S. National Park System, which manages approximately 84.4 million total acres of land and water (340,000km2). NMSP therefore has abundant available economic, cultural, and natural resources within its boundaries. However, NMSP has not yet established a public private partnerships (P3s) program that maximizes the full extent of these resources. The U.S. National Park Service (NPS) on the other hand has developed a variety of programs and initiatives designed to maximize the potential value its areas have. These programs have been created to help protect and conserve the natural beauty and habitats the park system is famous for. By leveraging the park system’s resources, NPS has been able to create environments not only conducive to conservationism, but business growth and commercial partnerships as well. Many of these initiatives are able to be replicated across other environmental conservation systems, including NMSP. While NMSP has its own unique challenges and limitations, several policies and programs can be implemented that can better leverage its own economic value. Bolstering such value can be an effective way of increasing total public outreach and engagement with the system. Additionally, there are opportunities for businesses to help protect and preserve ecosystems while making profit. Using the practices NPS has made to increase the National Park System’s economic value, several recommendations will be made to analogously create value in the U.S. National Marine Sanctuaries. This article recommends the implementation of several sustainable financing options to increase revenues into NMSP. The National Oceanic and Atmospheric Administration’s Office of National Marine Sanctuaries (ONMS) has limited resources to manage its 14 MPAs. With a budget of only $49 million USD in FY2016, the office faces significant challenges to increase its total value output (National Oceanic and Atmospheric Administration, 2016). However, businesses and non-for-profit institutions may be able to help the office accomplish its goals through the formation of P3s. Officially, the primary objective of the sanctuary system is to protect marine resources, such as coral reefs, sunken historical vessels, or unique habitats (Office of National Marine Sanctuaries, 2013). Recently, however, ONMS has explored the economic earnings that could come out of the system through many different industries, such as recreation and tourism. Meanwhile, the concept of ‘sustainability’ has become increasingly utilized in ecotourism settings (Wight, 1993). Research in this area has shown that recreation and tourism can help promote public awareness and understanding of natural habitats. Furthermore, this understanding can yield greater potential for the overall protection and conservation of important marine ecosystems (Svoronou & Holden, 2005). Along the lines of sustainability, ONMS is now seeking to develop an additional primary objective for the sanctuary system, which involves the capturing and sustainment of NMSP’s economic resources. While many barriers exist to forming P3s, the benefits that can be attained out of such collaboration are plentiful. P3s are widely seen as a cost-efficient and effective tool to implement and scale public policy in a given circumstance. However, such organizational collaboration can also be very challenging to achieve. The most important challenge that managers must overcome is trust. In order to develop the sanctuary system’s trust alongside the private sector, ONMS first needs to build relationships with key stakeholders from the private sector. Additionally, investigation on the economic potential NMSP has within its boundaries and jurisdiction is also needed. To do this, the office has established a National Business Council made up of executives and stakeholders who represent both businesses and non-profit institutions (Office of National Marine Sanctuaries, 2016). The National Business Council was created to help ONMS develop strategic plans to further relationships and opportunities between the private sector and NOAA. By fostering public-private partnerships, ONMS will be able to yield greater value out of the sanctuary system. Furthermore, these initiatives may allow the public to become more aware of the unique habitats and historical structures located within the underwater sanctuaries. Despite being an environmental conservation system, NMSP allows certain commercial industries to utilize its resources. The fishing industry, in particular, is allowed to utilize sanctuary resources within limited capacities and areas. Additionally, NMSP has historically utilized commercial industry to help protect areas from environmental degradation. For example, the Florida Keys National Marine Sanctuary (FKNMS) has recently partaken in lionfish removal events, such as derbies and contests. As an extremely harmful invasive species across the Western Atlantic Ocean, these derbies have proven to be very useful in both engaging the public with conservationism and helping limit the further growth of lionfish populations. By connecting with local stakeholders, these events have been able to remove thousands of lionfish per day while collecting valuable data for resource managers and researchers (Morris Ed., 2012). Furthermore, events like these encourage participation through awards and prizes given out by sponsorships. Commercial use of lionfish can perhaps make removal both sustainable and fully scalable. Efforts to make lionfish a commonly eaten food, such as NOAA’s “Eat Lionfish” campaign, have already made significant impacts on local fish markets across the Caribbean Sea (Huth et Al., 2016). However, further education and outreach is needed to broaden the commercialization of lionfish. Initiatives such as these provide resource managers with effective models to both conserve natural ecosystems as well as leverage greater economic value. Connecting market opportunities with conservationism is also an innovative way to broaden public outreach. Over the last century, the National Park Service has developed programs that leverage business growth alongside park restoration, enjoyment, and natural resource protection. This section describes some of those programs briefly and relate them to MPA systems, such as NMSP. NPS has been committed to providing recreation and tourism services to its park visitors since its founding. By ensuring public enjoyment of natural resources, the National Park System has been able to become a world-class attraction that has been modeled after by many other countries (Morris and Putnam, 2011). Two major programs that promote recreation throughout the National Park System are the Passport to Your National Parks program and the recently introduced Centennial Challenge program. In 1986, Eastern National (EN), a not-for-profit that collaborates with NPS and other public trust partners, established the Passport to Your National Parks program. The program allows park visitors to collect memento stamps at each one of the National Park System’s sites. Since its inception, over 1,300,000 Passport books have been sold by EN and 75,000 sell in National Park bookstores every year at a price of $50 USD each (Minetor, 2008). While the passport program has been able to further the enjoyment of the park system’s visitors, it’s also been able to successfully capture greater revenues for the National Park System. The provision of engagement programs such as this also helps sustain visitation. Overall, the passport program has inspired visitors to frequent multiple parks. Secondly, NPS recently launched its Centennial Challenge, where over 150 projects were selected in 2015 to leverage over $25 million USD in congressional appropriations with more than $45 million USD matching funds from partner organizations across the country (National Park Service, 2016a; National Park Service, 2016b). The Centennial Challenge will help NPS improve its park facilities and allow visitors to develop greater connections with the natural and cultural resources available across the United States (National Park Service, 2016c). NPS has developed a variety of initiatives designed to foster business growth and opportunities within its own operations as well. In particular, the agency’s National Park Business Plan & Consulting Internship has helped spur a culture of innovation and entrepreneurship within the agency’s workforce. The National Park Business Plan & Consulting Internship allows participating national parks to hire two professional graduate students with business, policy, and/or environmental backgrounds to live and develop a business plan for three summer months. The internship also pays each graduate student with a stipend of $725 per week plus housing and transportation. The intended goal of the program is to help sustain the long-term financial and operational health of the National Park System (National Park Service, 2014). By directly hiring young talent with business acumen, NPS can capture the human resources needed to collaborate with the private sector. NPS also encourages the development of restaurants, stores, and concessions within its parks through its Commercial Services Program. The program enables over 600 “concessioners” to gross over one billion USD each year by setting up shop in national parks (National Park Service, Commercial Services, n.d.). Additionally, the program helps support more than 25,000 jobs during peak visitation season and also allows the agency to collect additional revenues. This system is both sustainable and conducive towards NPS’s mission to provide public enjoyment in its parks. In addition to the National Park Service, other government agencies and organizations have established innovative methods to bridge the private sector with biodiversity conservation. Most often, the private sector in these cases means partnering alongside not-for-profit institutions. Developing sustainable financing options alongside the private sector can enable NMSP to achieve its goals more easily. Living Oceans (2014) noted several opportunities MPAs have to secure long-term funding. While most ocean waters cannot be owned by private entities, there are many examples of private citizens, NGOs, and private businesses purchasing terrestrial land and repurposing it specifically for habitat restoration and/or ecosystem protection. Living Oceans (2014) also noted the questions that have been raised on whether the provision of acquired waters for the protection of marine biodiversity would create a precedent for potentially harmful businesses to do the same. Additionally, the long-term viability of such partnerships may not be realized as private organizations can back out at any time. Regardless, there may exist opportunities for governments to work alongside private entities through binding agreements, endowments, and specific legal tools that grant organizations the right to own marine waters for the sole purpose of biodiversity protection. There are also many examples of individuals and entities supporting marine conservationism through private donations. The establishment of an endowment fund can provide for the long-term sustainability of such financial resources. Emerton et Al. (2006) noted that such donations can be a good source of supplemental revenue for agencies that manage MPAs. Private companies that seek to enhance their corporate social responsibility also have a long history of donating towards environmental protection causes and can be a significant source of financial resources for MPAs. Payment for ecological services can also enable MPAs to secure long-term funding. Through a ‘payment for ecosystem services’ (PES) system, the conservation of natural resources can be realized through a marketplace (Living Oceans, 2014). Incentives can be made to landowners who manage their land to enable greater output for ecosystem services. Additionally, entities that harm ecosystems that provide services for people may be required to pay for such degradation. A PES system has not yet been made available to any marine ecosystem. Despite this, there are two primary ecosystem services marine environments provide: carbon offsetting (the ocean’s capture of carbon emitted from fossil fuels into the atmosphere) and bioprospecting (raw biological and genetic resources for the development of medicinal and cosmetic products).